Hustings round-up – and how was it for you? The panel listens to a question from the audience at the Woolwich Riverside hustings. The hustings for Charlton and Woolwich Riverside wards have come and gone, and there wasn’t one fist fight to report – barely even a cross word. A good amount of people turned out for both evenings, and those that stayed around to chat at the end seemed on both nights to think that the Charlton Society’s experiment in access to local democracy had been worthwhile. Discussions were civil – audience members had a chance to put to the candidates the local issues that were really bothering them, and candidates responded thoughtfully. there’s much much more detail to be found in this collection of recordings and tweets: Woolwich Riverside Hustings. 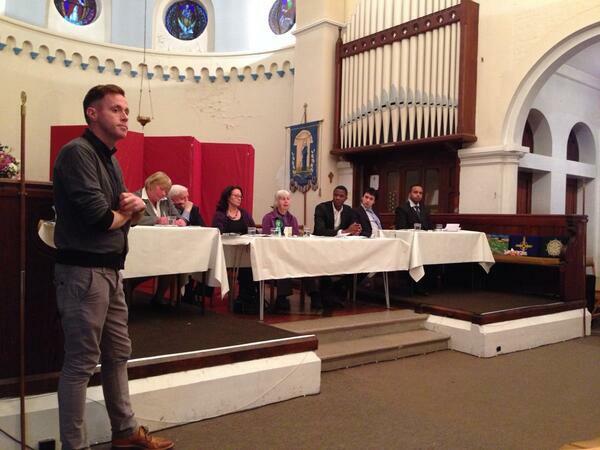 then, likewise, there’s much more for you to take in here: Charlton Hustings. In both meetings, one party’s candidates declined the invitation to appear: in Charlton, no Conservative candidates joined the meeting while in Woolwich Riverside none of the Liberal Democrat candidates appeared. In both cases, the Greenwich borough parties offered to send a substitute speaker, but the Charlton Society felt that the meetings would only keep their integrity as local hustings if only the candidates from that ward were on the panel. It’s probably fair to say that many of the attendees were not entirely new to local politics, and in both meetings the hosts didn’t make a point of asking those submitting questions to declare interests or introduce themselves. It’s probably worth thinking about this for the next time we do something similar in Charlton. At both meetings, questions were asked by people active in party politics and the process might be more transparent if everybody knew who was asking what. Did you go to one of the meetings? Were you happy with the way the candidates answered? Did you get out of the meeting what you hoped for? If you had anything to suggest to the organisers, what would it be? Let us know in the comments below. To say “the Charlton Society felt that the meetings would only keep their integrity as local hustings if only the candidates from that ward were on the panel.” isn’t accurate. After it became clear that the three Riverside Lib Dems were unable to attend, the organisers went to some considerable effort to include Lib Dem candidates from the next door and nearby wards in the interests of providing as wide a range of views as possible on the night. However, this was not considered acceptable by other attending candidates, and the organisers agreed that this was not an unreasonable position for them to take. Consequently, it became impossible to reach a compromise with out-of-ward candidates from the Conservative party for the next night. The organisers were disappointed that in each case major parties were not represented during the discussions but hope that now a precedent has been set for running fair, well moderated and unbiased hustings events, all those seeking election for the future will be keen to attend and make their case in front of the voters. Apologies to the Charlton Society for the initial error. Next Article What’s happening at Charlton House? And how would we know? Well done to the Charlton Society for organising these events. Can we have one for the General Election next year, please? These events are a great idea, but *just my 2p and feel free to ignore* I think that it would be perfectly reasonable for a party to offer someone from a different part of the borough willing to put their POV across, particularly as these are borough elections and a lot of what councillors get up to goes across ward boundaries. I think that’s better than having a party completely missing. I think the Charlton Soc made the right call – there’s a danger of setting a precedent where a party’s ‘best’ speakers end up doing a tour of hustings, covering up for the weaker candidates. I’d want to hear from the people standing in my ward. Yeah, I can see that side of it too. A second comment just to say thanks for doing the recordings too. Really really helpful material. As one of the candidates from the Charlton hustings, thought I’d add my own 2p to this (4p already gathered!). I thought both the Charlton and WR hustings were very well run, so kudos to the Charlton Society. I agree 100% with the transparency issue re questions from the floor, quite what an existing Labour Charlton councillor thought she’d learn from her 2 fellow Labour Charlton councillors that she didn’t know already is a mystery and I saw that as a clear attempt to either (a) give her own ‘team’ an easy hit or (b) trip up the other candidates or (c) a + b. A related observation is that if you’d taken Labour party members out of the room at Charlton we’d have had room for a game of 5-a-side football in there, but not enough players. That isn’t a criticism of Labour (any party should be able to bring as many as they want) or the Charlton Society who marketed the event well at short notice. It’s just a question of how do we make events like this as useful as possible by getting them seem by as many ‘normal’ residents as possible, not just the politically inclined. That’s a question for every area/level of politics of course, not just our ward. A final possibility for future hustings – because I really hope they continue and I am sure they will – is adding a final ’round-up’ for each party where they can, if appropriate, respond to comments raised during the event. It was hard during the event having your 2 minute slot to answer a question, then hearing a response but having no way to respond unless the question came up again in another guise. Just an idea. Oh, agree that eventually it was probably the right decision to only let ward candidates speak. A possible compromise would be to let subs from neighbouring wards only speak (to remove the ‘touring leader’ problem) but I think it’s probably opening a can of worms. If future events can have as much notice as possible then I think just ward candidates is fair enough. On this occasion I know of at least 2 candidates who weren’t in the country on the date specified. Sorry to ramble on. Again. Great event, well organised. And top Storifying skills! As the Green Party Candidate I think the right decision was made to limit the hustings to candidates from the ward. It was the first time I had done something like this (and my first foray into local politics) and I’d like to thank the organisers and the other candidates for making it a pleasurable experience. I dont know if we changed anyones mind, but I’m sure we gave the people attending something to think about. I went to the Riverside husting and thought the Charlton Society did a great job of organising. For next time, questioners should state their name and any affiliations they have. This makes the whole thing much more transparent for a non-politico like me. I’m sure there were reasonable excuses, but it was a real shame the Lib-Dems didn’t show up. I’ve just checked and our ward had the lowest turn-out of voters in the whole borough (31%). Events like this could help spread the word that local politics are important and worth going to the voting booth for. John, I’ve just mentioned to my wife that I thought the turnout was terrible. I didn’t realise it was the lowest in the borough.